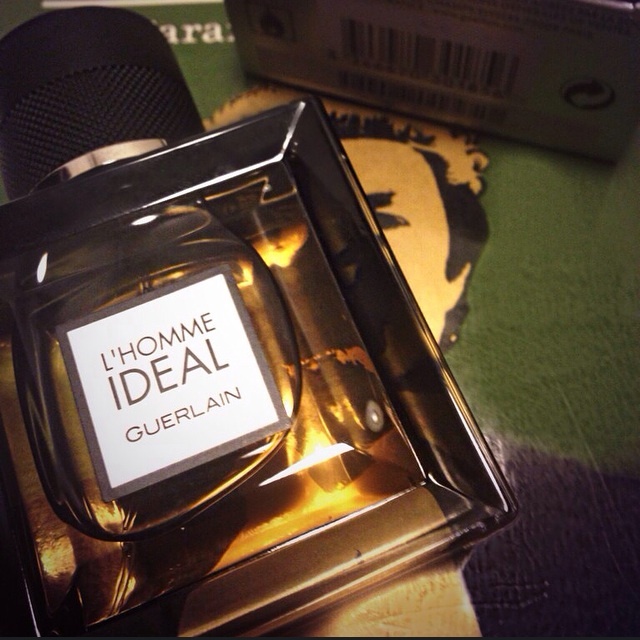 Guerlain’s take on an ideal man is rather satirical, and I love it. “The ideal man is a myth, his fragrance is reality.” Are the very incantations from Guerlain’s Thierry Wasser. It has been a while since Guerlain has released a masculine fragrance (the last popular one was 2008’s Guerlain Homme, a mojito scent! ), and L’Homme Ideal hits the nail on the head… almost. L’Homme Ideal is nice – but that’s about it. There is something missing in this fragrance, and that makes it somewhat lacklustre – not boring, but it lacks conviction in what it delivers. From the house that presented the amazing dusty orange Habit Rouge and the grassy Vetiver, it is understandably very hard to match its predecessors. Unfortunately the grandiose has left those expecting the next big thing from L’Homme Ideal with a sour taste in their mouths. It’s not bold, it’s not a classic, but rather it’s very contemporary. Guerlain has done what Guerlain does best, as L’Homme Ideal is a product resulting from the analysis of popular trend and translation, giving it the Guerlain flair. The current trend for masculine perfumery on an accessible ‘designer brand’ level almost always makes for a monotonous and fuzzy, boozy, woody fragrance with touches of lightness and hearty gourmand hits. These resulting fragrances smell incredibly powerful, and are filled to the brim with woody notes and accords giving a heavy complexion, then touched by the lightness of citrus or the piquant touches of pepper and spice for example. Thus, a sense of radiance and footing is given to the woods as an additional ingredient is added in deceitfully. If a blueprint is always used and merely a scarce amount of unique notes are added on top of that, we are presented with the conundrum that almost all masculine fragrances end up smelling similar to each other. Guerlain has changed that. And so, Guerlain has taken this blueprint and has thrown out the rules, looking for a historical precedent to follow instead, drawing inspiration from the house’s older fragrances. A very moreish almond comes from Jicky, whilst a fruity-citrus note is much like many older fragrances on offer by Guerlain. The minty camphorous scent of rosemary is new, giving a masculine and crisp edge. L’Homme Ideal is an attractive fragrance and very handsome in nature. There’s a trick to this scent, as there’s an accord in there that has been translated for today’s man from the famous Jicky fragrance also by Guerlain. This sense of austerity creates sentimentalism and triggers the brain to be somewhat impressed, or perhaps even addicted. The opening is quite spectacular. Wild and sour cherries, milky almonds, chocolate, sweet leather, weighty liquor, vetiver and an almost banana skin scent of roundness feels and faintly resembles the sweet note of playdoh. It’s an instant gourmand dessert hit of black forest cake – clearly La Petit Robe Noir’s brother (A contemporary female Guerlain also featuring dark cherries). In contrast to the sister, tonka bean makes the gourmand distinguishingly masculine. Cherry and amaretto notes are seldom used in masculine perfumery and hence the opening for someone who hasn’t done their research may be a cloudy haze that can be described broadly as uncoordinated, thick, or perhaps even a mess. With time the milky almond note permeates the blend, making me temporarily enamoured. There’s little to no lavender in sight and notes like vetiver, cedar, leather or citrus don’t become focal to the fragrance, unlike many men’s fragrances today. These notes (that are typically the main players) bolster up an almond ‘amaretto’ accord. The amaretto accord is L’Homme Ideal’s heart note, giving enough fleshiness along with the balsamic woods and the citrus pop giving a little touch of fizziness, like a balmy lemonade saturated with almond. Bitter bergamot and mandarin heighten the amaretto accord a bit like a garnish to a cocktail – Sure, it exists, but you generally just throw it away anyway. Whilst almond hangs around, the orange blossom, rosemary, leather and cedar linger also, creating a conflict resulting in a pleasing game of contrasts and concurrent melodiousness. In the end, L’Homme Ideal ends up smelling like a very serious gourmand fragrance. I’m happy Guerlain has entered this category – It’s refreshing. Yet L’Homme Ideal is mildly two-dimensional – it envelops you in Amaretto and dies slowly into a distorted fuzz of muskiness, lavender and cedarwood. The drydown was virtually a blur smelling like soap and again, playdoh: Vanillic, whimsical and like semi-sweet plastic. Alternatives: Speakeasy by Frapin; Tobacco Vanille by Tom Ford; and the Thierry Mugler series for men. This scent in the end is, as expected unoriginal, but an improvement for the men’s category. The ideal man…He doesn’t exist! Ladies, he’s probably gay. This entry was posted in Guerlain and tagged Fragrance, fragrance review, Guerlain, L Homme Ideal, L'Homme Ideal, The ideal man. Bookmark the permalink.